Although much of Marylebone sits on a grid pattern, the curve of Marylebone Lane that leads up from Oxford Street marks the path of the River Tyburn, which, in its heyday, supported some of London’s best salmon fishing. The Tyburn Angling Society, which is said to count, somewhat incongruously, Ken Livingstone and Nicholas Soames among its members, meets at the Golden Eagle on Marylebone Lane, about which more later. Musicians and artistic sorts abound. Noel Gallagher has been spotted in Waitrose and Paul McCartney was married from the registry office up the road. White Cube founder Jay Jopling lives just off the High Street and Working Title (producers of Richard Curtis films, among others) has offices locally, so you’ll often bump into film stars coming to and fro. Added to which, anyone who’s anyone will pass through the area on the way to see their consultants in Harley Street. Marylebone has one of the highest concentrations of blue plaques anywhere in London. Indeed, the first one was erected at 24, Holles Street to mark the birthplace of Lord Byron (the house has since disappeared). Stroll down Marylebone High Street to Green’s Newsagents, which also stocks a nice variety of greetings cards. St Marylebone sits at the top of the High Street. When it was first built, it was named St Mary’s, but soon became known as St Mary’s on the Bourne, then St Mary-le-Bourne, and then, finally, St Marylebone. Today, it is a lively focal point for local life with recitals and exhibitions. 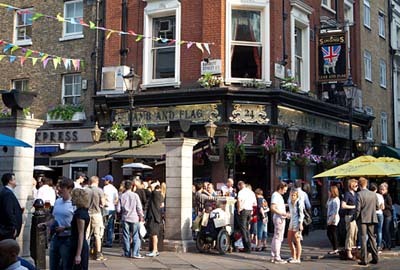 The Golden Eagle on Marylebone Lane is about the most atmospheric pub in the area, particularly as it’s minute, so it isn’t the obvious place for hoards of Oxford Street office workers to pile into at the end of the day. It’s standing room only on the nights that Tony ‘Fingers’ Pearson is at the piano. La Fromagerie is arguably the best cheese shop in London and you can eat lunch at the central table inside. Next door is The Ginger Pig, a butcher’s from the Yorkshire Moors, which also runs courses. Patisserie Valerie stocks delicious Continental breakfast goodies. Penton’s is a hardware store that has been going for 100 years, and Lewis & Lewis claims to stock every vacuum-cleaner bag ever made. The Button Queen is the capital’s only specialist button shop. There are also fantastic Sicilian perfumes to be found in Ortigia, kitchen equipment par excellence in Divertimenti and Daunt Books is the most inviting bookshop in town. Finally, the chemist John Bell & Croyden on Wimpole Street is one of the most distinguished in London. Where to begin? There are linen shops, clothes shops, interior-design and furniture shops, candle emporiums, jewellery shops and shoe shops (including James Taylor & Son, who’ll make you a bespoke pair) galore. For sustenance when shopping, head to Marylebone Lane for steak-frites at L’Entrecote, a burger at Tommi’s Burger Joint or fantastic fish and chips at the Golden Hind. Paul Rothe & Sons is a cafe that doubles as a delicatessen, and has been in the Rothe family for four generations. A throwback to pre-gentrification Marylebone, it maintains the old-fashioned charm of the village grocer. Locals swear by the coffee in the Nordic Bakery on Westmore-land Street. Providores on the High Street comes highly recommended for breakfast. The Marylebone Farmer’s Market is one of the best in London, with between 30 and 40 stalls taking over the Moxon Street car park on Sundays. Meanwhile, the Cabbages & Frocks market is held every Saturday from 11am to 5pm in the grounds of St Marylebone, and includes food stalls, retro, vintage and children’s clothes. The Summer Fayre takes place every year for charity, and is organised by the Howard de Walden Estate. The High Street is closed down and stalls, live music, dance lessons and games for children are set up. A smaller event is the lighting of the Christmas lights, which this year takes place on November 14. Children from local schools are invited to take part in the Christmas-card competition, and a Father Christmas holds court in his grotto. Of course, the West End and Soho are only a short walk away, but within the immediate vicinity of Marylebone are the Wallace Collection (home of numerous Old Masters and a remarkable armoury) and Wigmore Hall on Wigmore Street, one of the world’s finest chamber-music venues. Marylebone is by no means a trendy West End version of Shoreditch. There are no late night bars or clubs, so those that buy tend to be in their late twenties or early thirties or parents with older children, and a mix of UK residents and overseas nationals. In the mid 1990s, you could have found a five-storey town house for the relatively modest price of £900,000; today, that same house would set you back many millions.